Kuha’o Case, a 17-year-old piano prodigy from Hawaii, has been blind since infancy. 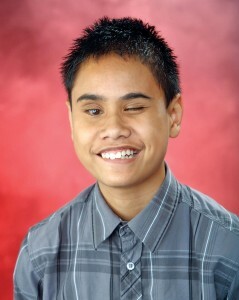 Born two months premature, Kuha’o had to undergo a necessary operation, which saved his life, but took his vision. The young Hawaiian can play a song note for note after hearing it only once or twice, and the song remains forever imprinted in his brain. He started teaching himself the piano when he was 12 and the organ, which he confesses is his true passion, at 13. He was first introduced to the keyboard at school. Kuha’o recalls: ‘The first time my fingers touched the keyboard, I felt overjoyed. It completely changed my world and my entire life.” Music had entered his life. Subsequently, he received a keyboard as a gift from a friend. Kuha’o’s family quickly realized his special gift, as they witnessed him create melodies and harmonies without any training. Wishing to support his talent, his grandparents purchased a piano, which Kuha’o could only practice on during the weekends, when his parents took him to visit them. It was only in the summer of 2012 that he got his own piano. Through the help of a Kickstarter campaign, he managed to raise over $30,000, which he used to buy a piano and record and release his first album, “Dare to Dream.” The campaign was run by a friend, Andy Thunell, who, apart from helping Kuha’o produce his first CD, is now helping with his second one, given the overwhelmingly positive response they received from people on the first. On the second album, Kuha’o intends to showcase his passion for organ. Andy was also the first one to upload videos of Kuha’o playing the piano on Youtube, after just hearing songs once or twice. The most popular one has almost 900,000 views. Since then, Kuha’o has started his own channel, where he posts his piano covers of classic and contemporary popular songs from artists ranging from Michael Jackson to One Direction. He has also started collaborating with other rising or well-known artists, such as violinist Lindsey Sterling, together with whom, the young Hawaiian covered ‘Oh Come, Emmanuel’ in December 2013. Kuha’o chooses to see no limits and has the courage to decide that he can do things that others might think impossible. Apart from self-teaching himself to play the piano and organ, Kuha’o has also learned to drive with the guidance of his grandfather and to horseback ride.